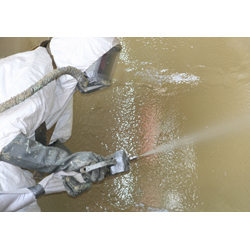 SprayWall is a self-priming polyurethane lining that reinstates structural integrity and provides infiltration control and chemical resistance. It may be applied up to 250 mils/6.35 mm thick in a single application. The lining begins to gel in approximately 8 seconds, with a tack-free condition after 2 minutes. Within 60 minutes, initial cure completes and the structure's capable of accepting flow. Complete curing continues during the next 72 hours.